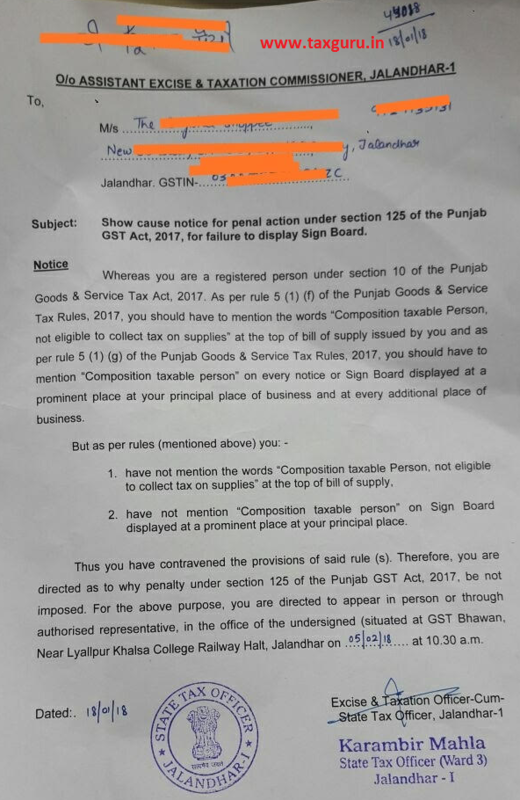 Subject: Show cause notice for penal action under section 125 of the Punjab GST Act, 2017, for failure to display Sign Board. Whereas you are a registered person under section 10 of the Punjab Goods & Service Tax Act, 2017. As per rule 5 (1) (f) of the Punjab Goods & Service Tax Rules, 2017. you should have to mention the words “Composition taxable Person, not eligible to collect tax on supplies” at the top of bill of supply issued by you and as per rule 5 (1) (g) of the Punjab Goods & Service Tax Rules, 2017, you should have to mention “Composition taxable person’ on every notice or Sign Board displayed at a prominent place at your principal place of business and at every additional place of business. 2. have not mention “Composition taxable person” on Sign Board displayed at a prominent place at your principal place. Thus you have contravened the provisions of said rule (s). Therefore, you are directed as to why penalty under section 125 of the Punjab GST Act, 2017. be not imposed. For the above purpose, you are directed to appear in person or through authorized representative, in the office of the undersigned (situated at GST Bhawan, Near Lyallpur Khalsa College Railway Halt, Jalandhar on 05/02/2018 at 10.30 a.m.
too they can create reasons for sending Show Cause Notice.